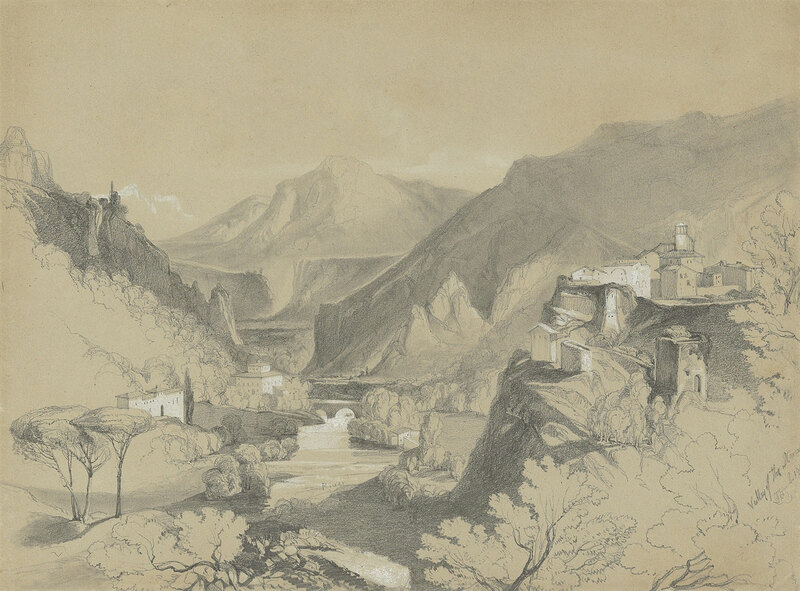 Edward Lear, A view of the Valley of the Nera, near Rome. Signed with monogram, inscribed and indistinctly dated ‘River’ (lower centre) and ‘Valley of the Nera/ EL 18[..].’ (lower right). Pencil heightened with white on buff paper. 10 ¼ x 13 ¾ in. (26 x 35 cm.). The present drawing dates from the period 1838-9, when Lear was living in Rome and made frequent expeditions into the surrounding Campagna. with Hazlitt, Gooden & Fox, London, where acquired by Christian Peper, 1976. Christian Peper; Christie’s, New York, 26 January 2012, lot 23.